A quick application note: all these cream polishes applied like buttah. Seriously. I mean, the colors aren’t revolutionary but I am a sucker for a great cream polish and all of these fit the bill. This first mani I started with 2 coats of Julie G White Orchid [purchased myself]. I used a version of a dry brush technique with Eden [yellow green] and Tropical [brighter minty green]. I dropped blobs of each, then dragged a long nail art brush through it, wiping off the excess. Then I dragged the brush across each nail. I then applied a pinwheel nail vinyl over that (after drying, of course) and sponged Karma on top. I adore how this turned out, it’s like vintage jungle print or something. 😀 Just goes to show you don’t need flashy polishes to have a flashy manicure! 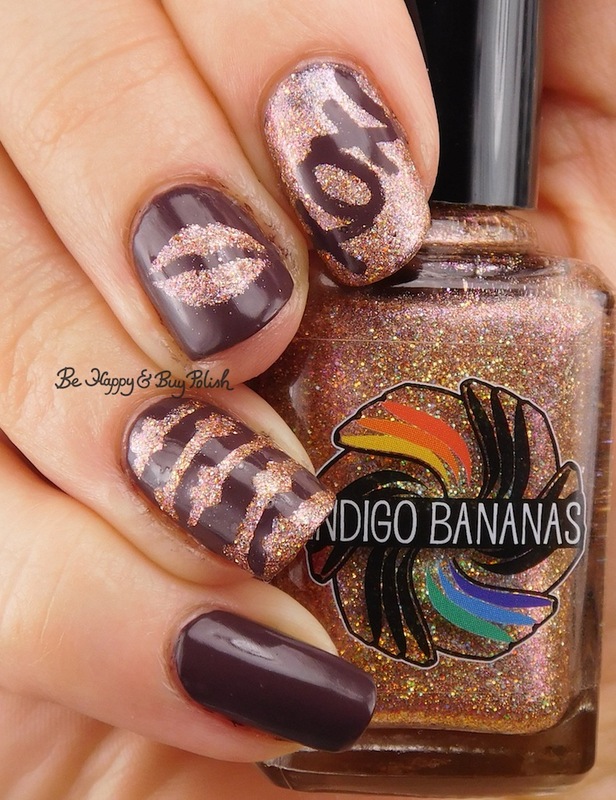 Speaking of flashy…next mani I created, I started with JulieG Henna, a purply brown – almost bruise toned but not quite. This has beautiful shine and coverage but did need 2 coats. This is 2 coats and no top coat. 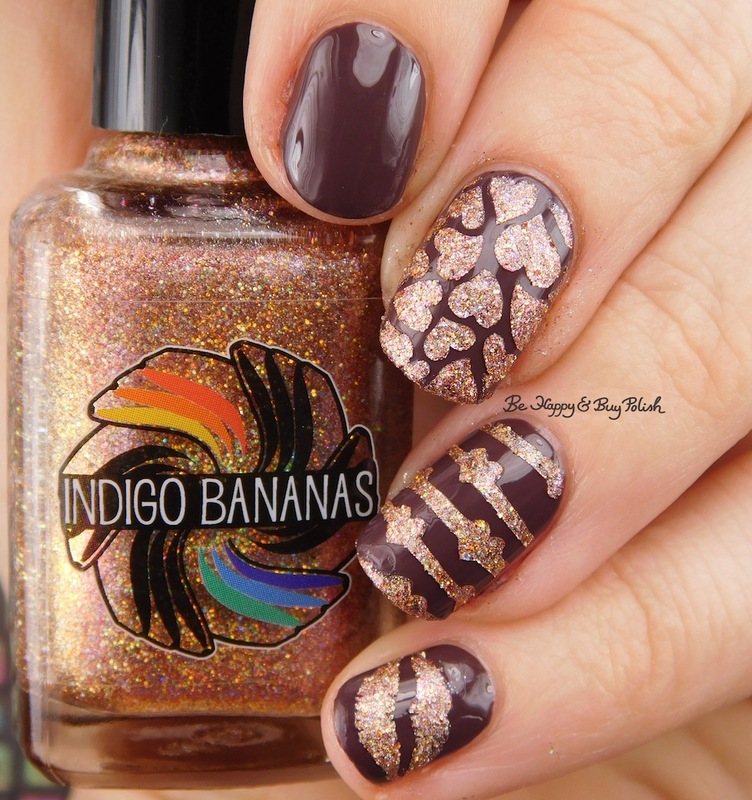 I then used Indigo Bananas Sequins of Events with various decals from Sweet Lacquer Vinyls [press sample]. This turned out so pretty! Next was actually a pedicure (that’s still on my feet!) with JulieG Harmony. This is really where that buttery application comes in handy because who wants a fussy cream polish when you’re trying to paint your toes?! Not this woman. 😉 This is 2 coats. I also used Zoya Pixie Dust Alice with Polished Vino silhouettes nail vinyls and Crystal Parade nail gems. And last was a disappointing manicure. Not because of the polish! But because my nail art skills have deteriorated. 😦 Anyway, I started with JulieG Aria – this is 1 coat and no top coat. I then used what I’m calling brocade nail vinyls with JulieG Faith. I really loved this tone on tone look but I wanted more. So I tried free-handing skulls on top of this and let’s just say…. *stage whisper* it wasn’t pretty. I didn’t even take a picture of the ugliness! The JulieG Bohemian Dreams collection is currently available at Rite-Aid Stores and Jesse’s Girl Cosmetics for $3.99. Okay, I hope you forgive me for not showing you proper swatches of each but I hope you understand. 🙂 Let me know which of these manis is your favorite! 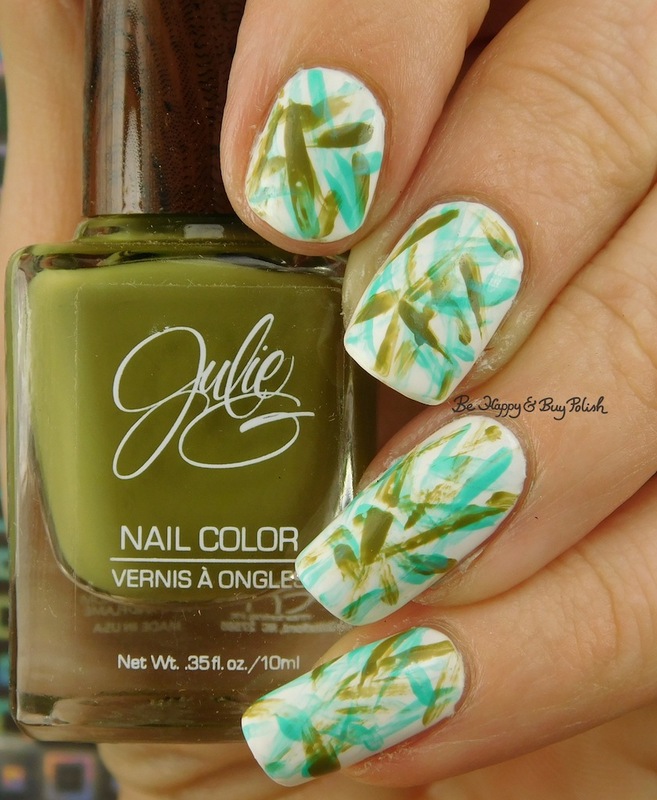 Some great colors and nail art!